Lightgallery works across operating systems. You can use it on OS X, Windows, or Linux. 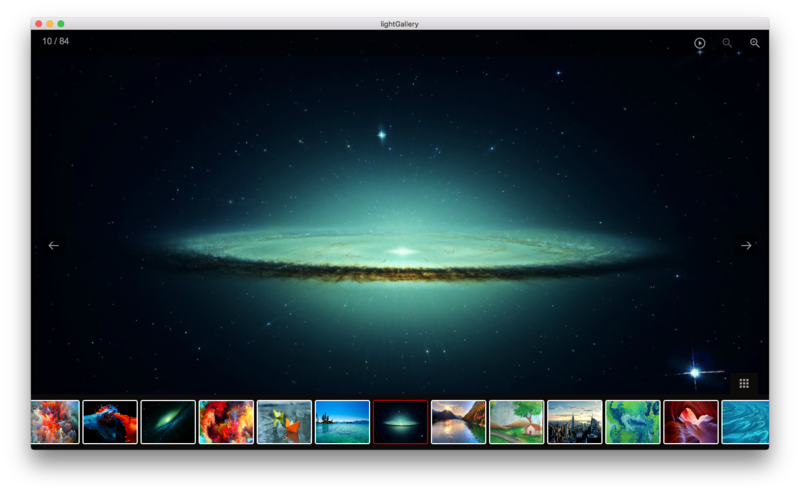 LightGallery comes with numerous number of beautiful inbuilt animations. You also have the option to enable animatedthumbnails from the settings. You can double-click on the image to see its actual size. Zoom-in and zoom-out controls can be used for changing the zoom values of the image. Lightgallery allows users to navigate between slides via mouse drag and keyboard arrows. speed 600 Transition duration (in ms). useLeft false force lightgallery to use css left property instead of transform. closable true allows clicks on dimmer to close gallery. loop true If false, will disable the ability to loop back to the beginning of the gallery when on the last element. controls true If false, prev/next buttons will not be displayed. hideControlOnEnd false If true, prev/next button will be hidden on first/last image. counter true Whether to show total number of images and index number of currently displayed image. swipeThreshold 50 By setting the swipeThreshold (in px) you can set how far the user must swipe for the next/prev image. animateThumb true Enable thumbnail animation. thumbWidth 100 Width of each thumbnails. toogleThumb true Whether to display thumbnail toggle button. enableThumbDrag true Enables desktop mouse drag support for thumbnails. swipeThreshold 50 By setting the swipeThreshold (in px) you can set how far the user must swipe for the next/prev slide. pause 5000 The time (in ms) between each auto transition. autoplayControls true Show/hide autoplay controls.